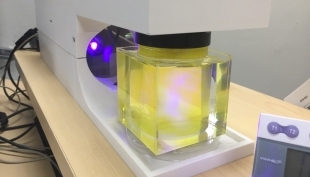 Scientists at LLNL and UC Berkeley have developed technology that can beam a 3D video into a container of photosensitive resin like this one. “It looks like something you might find aboard the Starship Enterprise,” said Jeremy Thomas, a spokesman for Lawrence Livermore National Laboratory (LLNL). He was talking about a projector that can beam a three-dimensional video into a container of photosensitive resin (pictured, photo by Hossein Heidari, UC Berkeley). The container then rotates for a few minutes, lets the fluids drain and then leaves behind a complete, fully formed 3D object. “Though it seems like science fiction, it’s not, thanks to scientists and engineers at LLNL and UC Berkeley, who have developed a brand-new high-speed 3D printing method called Computed Axial Lithography (CAL),” Thomas said in an announcement about the procedure. The method is described a paper printed in the journal “Science,” published online Jan. 31. “This is a breakthrough in the space of possible methods to do additive manufacturing,” said LLNL engineer Maxim Shusteff, a co-author on the paper. “What this approach does is make it possible for interesting polymer parts to be made much more quickly, which is often a bottleneck, and we can now think about using materials that don’t work well with slower layer-by-layer methods,” Shusteff added. “In 2016, UC Berkeley grad student and co-lead author Brett Kelly, who worked on the volumetric project at LLNL, and his UC Berkeley professor Hayden Taylor, decided an alternative method was necessary to expand the geometric freedom and print more arbitrary, complex objects,” Thomas said. For their first test, the Berkeley group successfully printed a 2D model of the UC Berkeley logo, and followed that with simple 3D models of atoms and spheres. Subsequent test parts printed at Berkeley and Livermore included a small airplane model, lattice structures, a disconnected sphere inside of a cage, a lens and a miniaturized version of Rodin’s famous sculpture “The Thinker.” The largest object was a model of a human-sized lower jawline, showing that CAL could be capably used to create dental implants. Kelly explained that one of the parts, a screwdriver, is evidence of CAL’s unique capability of “overprinting” — printing a polymer object over an existing object. Kelly added that the CAL technique also opens the door to printing with materials like extremely viscous polymer resins that can’t be used with traditional layer-by-layer 3D printing. The project was funded through the Livermore Lab’s Directed Research and Development program and by UC Berkeley faculty startup monies. Work will continue to produce structures of much larger volumes, Thomas said. Lawrence Livermore National Laboratory is managed by Lawrence Livermore National Security, LLC for the U.S. Department of Energy’s National Nuclear Security Administration. This article first appeared at Pleasanton Weekly on Feb 4, 2019.